Richard L. Wolfe was born sometime around 1837 in County Kerry, Ireland. He was the son of Thomas Richard Wolfe, a Catholic farmer, and Ellen Leahy Wolfe. He had nine siblings: Margaret (b. 1837), John (b. ca. 1839), Thomas L. (b. 1840), Hanora (b. ca. 1843), James (b. ca. 1845), Mary Johanna (b. ca. 1846), Catherine “Kitty” (b. 1847), Ellen “Nellie” (b. 1853), and Maurice (b. ca. 1855). John Wolfe died between 1848 and 1850, and James before 1850. In 1889, Wolfe married Mary Fanning, of Ottawa, Illinois, in that city. Her obituary described her “highly educated and refined.” They had two children: Richard and Irene (b. 1892). Richard died sometime before 1900. The family farmed in the town of Templeton, in Carroll County, about fifteen miles south of Carroll, and Wolfe served on the county board of supervisors. By 1900, they lived in Audubon, another fourteen miles south. Soon, however, they returned to Carroll, where they purchased a home on North Main Street. 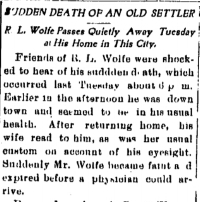 Wolfe signed his will on May 9, 1901, and died unexpectedly on June 7, 1904, in Carroll. According to his obituary in the Carroll Sentinel, he was in downtown Carroll about six o’clock in the evening “and seemed to be in his usual health. After returning home, his wife read to him, as was her usual custom on account of his eyesight. Suddenly Mr. Wolfe became faint and expired before a physician could arrive.” Mary Fanning Wolfe died in Carroll in April 7, 1918, and she and her husband are buried together at Saint Columba Cemetery in Ottawa, Illinois.